The LLOYTRON Hobby Desk Lamp is a excellent multipurpose light. Use it on your desk or on your bedside table. The Lloytron selection comes in a range of colours to match the colour scheme of your room. There is an elegance in the simple design of this versatile light. It has a well balanced design and the flexible construction means it is very adaptable. Use an LED bulb and there is no problem with heat. The stable base is an excellent bonus. The flexibility of the stand and the lamp make the LLOYTRON hobby desk lamp ideal for lighting up anything. It could be on your desk for writing, hobbies or home computing or it could be on your bedside table. 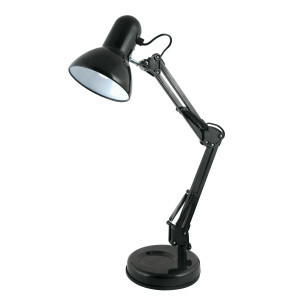 The versatility and flexibility of the lamp makes it ideal for close up work or to provide a softer light for reading. Is it the perfect lighting solution? The lamp feels quite weighty and the base is very sturdy. The lamp does not overbalance and it is difficult to knock off a bedside table. There is a small well in the base to keep useful items like paper clips, stamps or other small office supplies. In many ways it is a copy of the classic Anglepoise lamp of the 1960s and 1970s. Buy a LLOYTRON Hobby Desk Lamp now. Really great little light.smart,not to big.well balanced.really pleased with it. I think this lamp looks more expensive than it was. I have suffered a big sight loss of 75% and so find it hard to do a lot of jobs about the house and workshop. This light proved to be a god send. it’s a very solid simple design and a good size. Obviously designed very well given a tight budget.